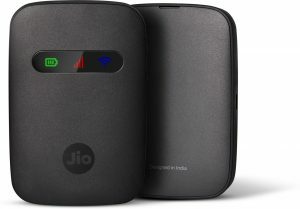 Reliance digital LYF has introduced a hotspot device with Jio 4G SIM named Jio-Fi. The second generation of the dongle is available on the market since earlier this September 2016. The device has blazing fast internet with download speed up to 150 Mbps and upload speed up to 50 Mbps. Now user can access high speed 4G data and download Jio4GVoice app on your 2G/3G smartphones to make voice and video calls. The Jio-Fi device Recommended connecting up to 10 Wi-Fi enabled devices like Smartphone, Laptops, Tablets and even Smart TVs. The device has a multicolor LED and The LED shows the 4G Signal Strengths grade wise like excellent, good, poor and out of range.